To open this document, I then have to click on Properties and click on "Unlock" button. Once I do that, it opens the file. But this I have to do for all files. I want a solution which removes this error completely. With Attachments selected look in the right window pane for a DWORD Value called SaveZoneInformation, double-click it and enter a value of 1 (if the Attachments key does not exist, and there's a good chance it won't, go to the next step). 3a. If you do not see the Attachments key in Policies, do the following: right-click on Policies and select New and then select Key. Name this key Attachments. Now right-click on Attachments and select New and then select DWORD (32-bit) Value. Name this value SaveZoneInformation. Now double-click SaveZoneInformation and set its value to 1. Now reboot your PC or log off Windows and log back in for the change to take effect. ^^The above setting change will only affect any new files added to your PC going forward. Move all the files you would like to remove this attribute from into one folder location. Doesn't matter where. Not the answer you're looking for? Browse other questions tagged microsoft-word microsoft-office microsoft-word-2010 microsoft-office-2010 or ask your own question. 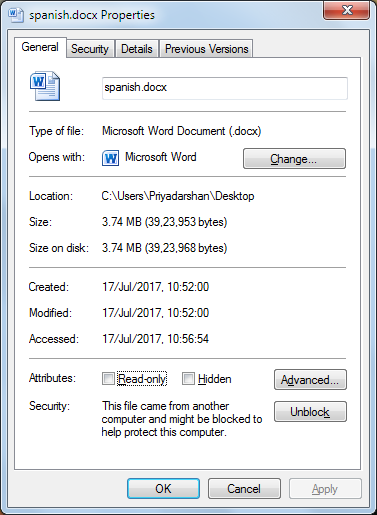 How do I get a PDF link in a Word document to open in the default browser? 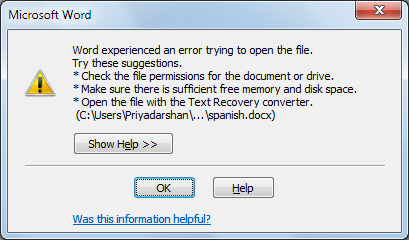 Open .docx files with Word Starter after uninstalling trial Word 2010? How do you link to an anchor inside a Word document from outside of Word?